► Make sure that the vehicle is stationary and that the SmartKey is in position 2 in the ignition lock. ► Press button 2 for the exterior mirror on the front-passenger side. ► Use adjustment button 3 to adjust the exterior mirror to a position that allows you to see the rear wheel and the curb. 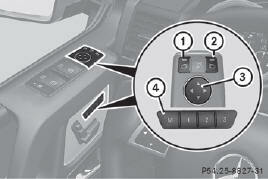 ► With the exterior mirror on the frontpassenger side activated, use adjustment button 3 to adjust the exterior mirror. In the exterior mirror, the rear wheel and the curb should be visible. ► Press memory button M 4 and one of the arrows on adjustment button 3 within three seconds. ► If the mirror moves out of position, repeat the steps. ► Adjust the exterior mirror on the frontpassenger side using button 2.